Join Special Agent Fangs Enigma – the world's greatest vampire spy – and his werewolf sidekick Puppy Brown as they battle society's worst criminal monsterminds. Sixth in a new series of comedy horror adventures from the bestselling author of Scream Street. Special Agent Fangs Enigma and his sidekick, werewolf Agent Puppy Brown, were recruited by secret intelligence agency MP1 (Monster Protection, 1st division) to stop the world's super(natural) villains and monster criminals from realizing their evil plans. In Mission: Lullaby, super-villain wannabe Derek Dopper has hired two unlikely henchmen – Agents Enigma and Brown! Fangs and Puppy are undercover investigating the criminal organization known as GLOVE. 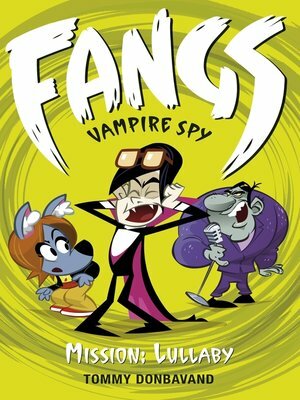 Can Fangs and Puppy catch GLOVE's head honcho Mr Big or will they return empty-handed?